Butternut Squash Toast with Pistachios and Sage | Naturally. I like a solid, savory breakfast. Eggs, some form of vegetable, and a thick slice of toasted wheat bread. This butternut squash toast is all of that combined. The original recipe, from the Easy Vegetarian Cookbook, is one of my variations for bruschetta. It’s a fairly loose bruschetta but the herbs and squash find a good companion in the crunch of the pistachios. 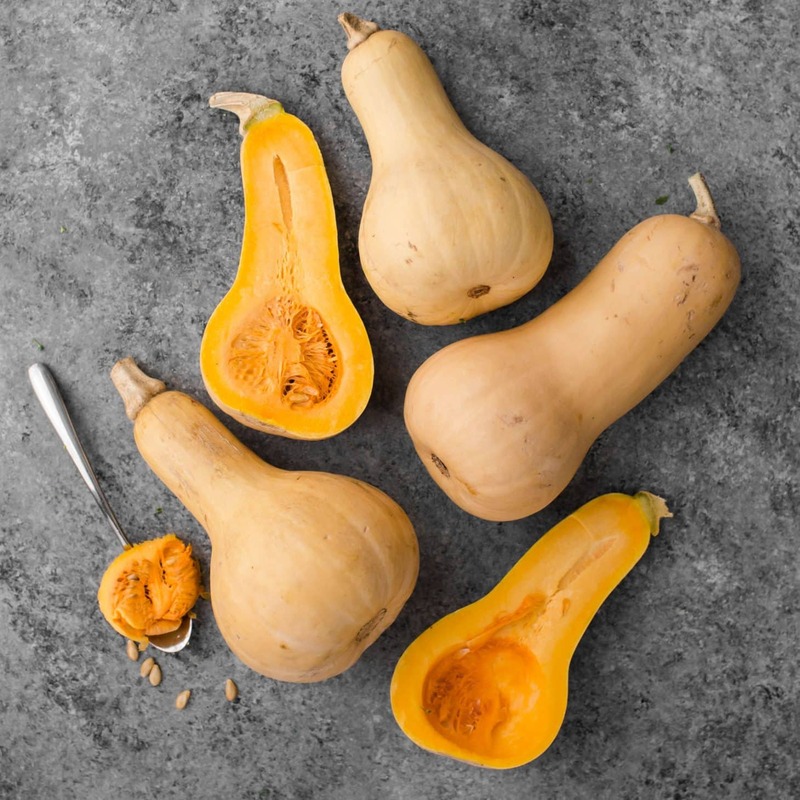 The squash mixture could easily be made ahead of time leaving the toast and egg preparation during breakfast. 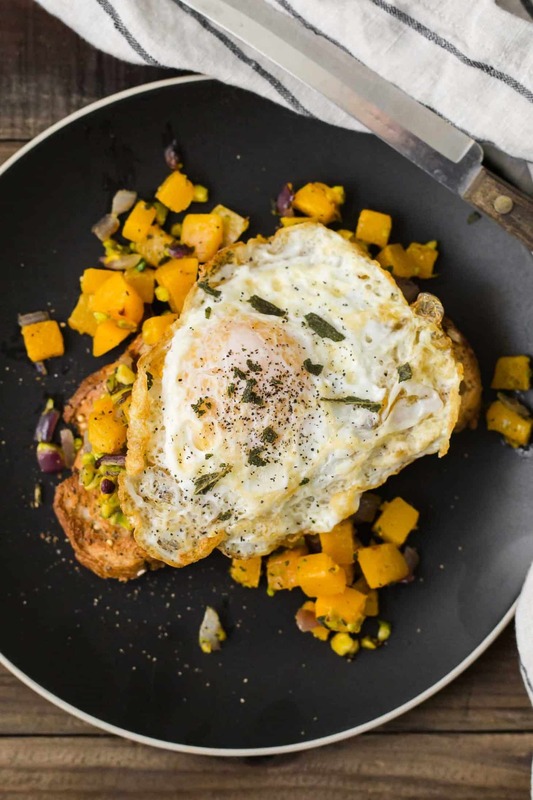 A hearty breakfast toast that highlights the flavorful pairing of roasted butternut squash with sage. To make the squash: Preheat the oven to 400 ̊F. In a roasting pan, toss the squash with the red onion, olive oil, sea salt, and black pepper. Roast until tender and browning, 30 to 35 minutes. To make the pistachios: In a small skillet, heat the olive oil over medium-low heat and add the sage leaves. Fry until crisp, 1 to 2 minutes. Remove the sage from the pan and place on a cutting board with the pistachios. Chop until the pistachios are in small, meal-like pieces. Toss the roasted squash mixture with the pistachio mixture until well combined. 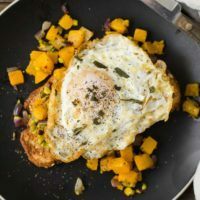 Toast the bread and top with the butternut squash mixture, fried egg, fresh cracked pepper, and a crumble of fresh sage. Tips & Tricks: Roast the squash ahead of time to use throughout the week then you can toss the pistachio mixture when you’re ready to make this toast. You could also use whipped squash and sprinkle the pistachio mixture on top of the egg. As mentioned above, this butternut squash toast is a riff from a recipe that originally called for pumpkin and served as an appetizer. The egg helps to round out the meal but you could easily leave out the egg and top smaller pieces of toasted bread. 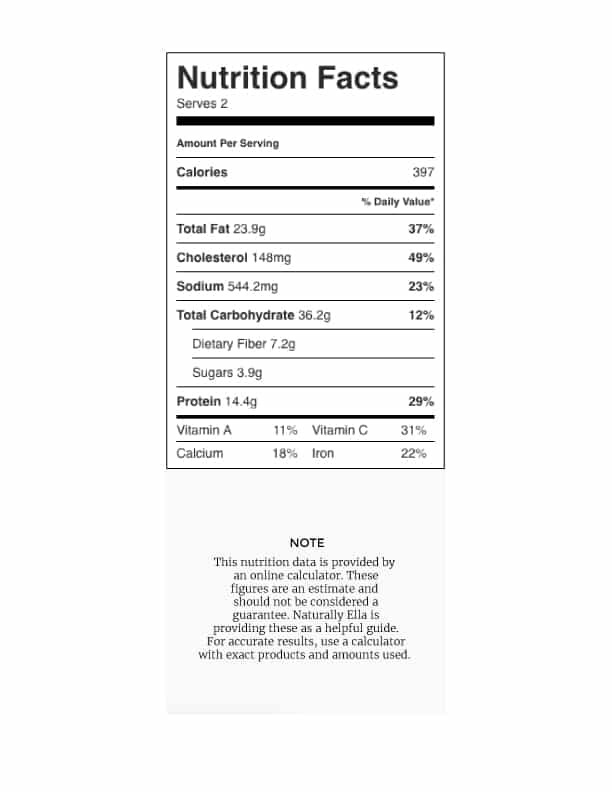 Sweet Potatoes: Use cubed sweet potato in place of the butternut squash. Other hard, winter squash would work as well. Salad: Ditch the bread and top greens with the butternut squash mixture and fried egg. Vegan: Instead of a fried egg, you toss chickpeas into the butternut squash mixture for the last 15 minutes of cooking. Tofu scramble would also be a nice addition. Nuts: Walnuts, pecans, or hemp seeds could work in place of the pistachios. I will occasionally sprinkle hemp seeds on top with the pistachios. Such a perfect breakfast item for the winter! I am the same. I like a savory breakfast with veg and an egg or two. Just posted one with cauliflower and mushrooms. This recipe looks perfect. Love the pistachios! I’m going to try this with the leftover squash I have. Thanks! I’m really liking the idea of this as a salad for lunch (we eat your lentil/sweet potato salad with fried egg fairly often). I have to contemplate the breakfast version because it is very different from what I’m used to eating for breakfast. The problem with the “make ahead” idea is that the squash gets devoured before the egg ever gets fried. Yummy recipe with the pistachios and sage. Lots of flavors going on that make me feel good on the inside and out! Thank you!